The Gjallarhorn, or "Yelling Horn" is used by the Minnesota Vikings to announce the start of each home game. The instrument has its origins in Norse mythology where acording to legend, the Gjallarhorn was sounded to announce the arrival of the gods. In 2007, Groth Music was asked by the Minnesota Vikings if they were able to help them locate a Gjallarhorn. The Groth Music staff did some extensive research and scanned through their list of thousands of vendors and manufacturers, but found no occurences of the elusive instrument. In an effort to live up to the company motto, "We know what you want and we have it." Groth Music General Manager Todd Johnson endeavored to manufacture the Gjallarhorn himself. The rest is history. Today each Minnesota Vikings home game is announced by an "Honorary Viking" playing the Gjallarhorn. Some of the distinguished Gjallahorn players include legendary Vikings Mascot Hub Meeds, Gjallahorn creator Todd Johnson, Running Back Chuck Foreman, Vikings Hall of Fame Coach Bud Grant, Vikings Ring of Honor Coach Jerry Burns, Vikings Hall of Fame Defensive End Carl Eller, Honored American War Vet John Kriesel, Minnesota Wild All-Star Right Wing Mark Parish, Minnesota Twins All-Star Catcher Joe Mauer, Two Time Olympic Medalist Dennis Koslowski, International Tennis Pro Mardy Fish, Olympic Gold Gold Medalist Shawn Johnson, Vikings All-time Leading Rusher Robert Smith, Captain Dustin Snare - Live from Iraq, UFC Heavyweight Captain Brock Lesnar, and an ever-growing list of other distinguished figures. 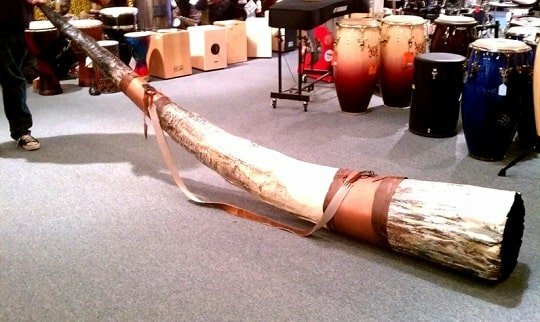 This 10 foot version of the Gjallarhorn was the original version produced by Todd (TJ) Johnson for the Minnesota Vikings in 2007. It was later replaced by a larger version also made by Mr Johnson and still currently used by the team. The version in this photo currently finds it's home at Groth Music in Bloomington, MN. This smaller version of the Gjallarhorn was specially produced for the November 15, 2009 Detroit Lions vs Minnesota Vikings game where the horn was played by Minnesota National Guard Captain Dustin Snare live by satellite from Basra, Iraq, while the soldiers of the 34th Infantry stood by waiting to watch the game. 2016 Wildcard Game - TJ Saves the Day!